Last week there was an interesting observation made about Marketing Automation platform providers. In his well-reknowned blog, David Raab (@draab) commented that after all these years, the consolidation of Marketing Automation providers suprisingly hasn’t slowed the growth of the second tier of players in the space and there is more fragmentation. David’s first line in the blog is “I’ve gotten used to thinking of the B2B marketing automation industry as entering a consolidation phase, during which a handful of dominant vendors emerge and small vendors drop away.” We have done the same thing. Back at the start of the commercial Internet, we saw firms like UUNet, DIGEX, and PSINet dominate the Internet Service Provider space. Later on we saw Covad, NorthPoint Communications, and Rhythms NetConnections grow to dominate the fledgling Digital Subscriber Line space; so we have been conditioned to think in a “Big Three” mentality that has progressed into the CRM space with the likes of Salesforce, Oracle, and NetSuite. 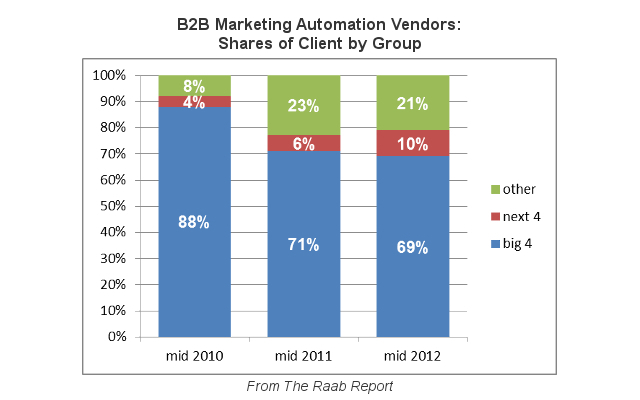 Now there’s Marketing Automation and guess what? Is there a “Big Three” in this space? Well, we agree how David points out that in his spreadsheet, Infusionsoft and HubSpot are effectively different from Eloqua and Marketo Infusionsoft has a great platform and story, but they really seem to target small businesses and “solopreneurs,” as does HubSpot (which, a year after their acquisition of Performable, hasn’t robustly integrated the Marketing Automation platform into their “inbound marketing” platform). So we like to look at the “Big Three” in Marketing Automation as Eloqua, Marketo, and Pardot – these are the companies we think are most likely to lead the way in the foreseeable future. Incidentally, whereas a few years ago we had to spell out “Marketing Automation” to Marketers, now we find them coming to us already knowing about those three players. They’ve done a great job building their brand to the point where they are well known to Marketing Professionals and others outside the discipline, especially in light of Eloqua’s recent IPO and Marketo’s publicly stated desire to follow suit. Pardot has bootstrapped itself all the way to their success and must be reckoned with if you are searching for a platform. These three have established and are continuously institutionalizing the customer support infrastructure necessary to help their customers succeed at use of their respective platforms; they are providing best practices and templates and hosting user conferences. Clearly they are maturing, and your chances of hiring someone with experience on those platforms is slowly growing every week. We are at a point where if you select one of the “Big Three” Marketing Automation platforms, your’re on the right track (However, don’t EVER forget you should have the lead management processes in place that are agreed upon by both your Marketing and Sales departments!!) But what about the others that David mentions – Net-Results, Act-On Software, and SalesFusion? Should you bother looking at those solutions? Absolutely! We’ve seen these platforms in action and they all have solid benefits. It pays to demo them so you can see how easy they may be to use and to determine which does the best job in meeting your marketing needs and budget. For example, the Net-Results platform has impressive segmenting capabilities that you can master from day one, so if you have a complex matrix of content that needs to go to various audiences, they are definitely worth considering. All of these “second tier” providers should be looked at as “second” not because of deficiencies in their platform features, but only in that they just don’t have as many customers since they have been growing organically without a significant infusion of third party capital. We’ve also spoken with the executives of these firms and it’s clear that for them, the race has only just begun. We like these professionals and want to see them succeed. They have passion, believe in their offering, and may have some creative ways to help you get going with their platforms. As a whole, Allinio is platform agnostic and wants to work with any company using any platform for Marketing Automation. Yes, there’s a lot of hype about the Big Three and we happily implement those platforms. But don’t forget the other players that are fighting for a relationship with you. So thanks to David for making us think about the industry more clearly. We appreciate his efforts and respect him for being there from the beginning of it all and doing his own unique part in help us all sort out what the heck is going on with all this Marketing Automation buzz. David, keep up the great work!